This is my very first Birchbox so needless to say, I was super excited about it! I was away on holiday when the box arrived, so this is about 2 weeks late – I ran down to the post office to pick it up the first chance I had! My birchbox is from France, and it appears that the products in them are not the same as Birchbox in the US. I’m actually glad that it isn’t – because this means that I get to try out more interesting things that I’ve not seen before. This month’s theme is “Au Bord De L’eau”, which I think translates to “at the water’s edge” or something like that. Birchbox France costs €13 a month, with free postage to the regular Relay Point; I paid an extra €2 to have it delivered to my door. This month’s box came with a small squishy makeup pouch in light grey-blue with a bright pink zip. With my very limited french-language knowledge and the even more limited English words on this item, I assume this will be an energizing shampoo with anti-oxidants to fight against pollution and the sun. This doesn’t really have a scent; will be going into my shower. This has such a cute packaging!!! If you didn’t notice, it says “the older, the smarter” on the tube. Would be great to test too, now that I’ve entered into my 30s. This has a really lovely light floral scent; it’s not overpowering, which I love, but there is still a distinct scent. I do love L’occitane’s bath products so this will be going into my shower. Finally!!! I see a makeup item in a beauty box! I’m so happy to finally get a proper makeup item in a beauty box rather than an entire box of bath items. This is also a really lovely champagne colour – can’t wait to try it! This claims to clean, control and sooth; contains roman chamomile, white willow and oat, with 99% of the ingredients with natural origin and 30% organic. I’ve mentioned this before but I don’t trust organic and natural claims; I care more about whether it works. And that’s it! 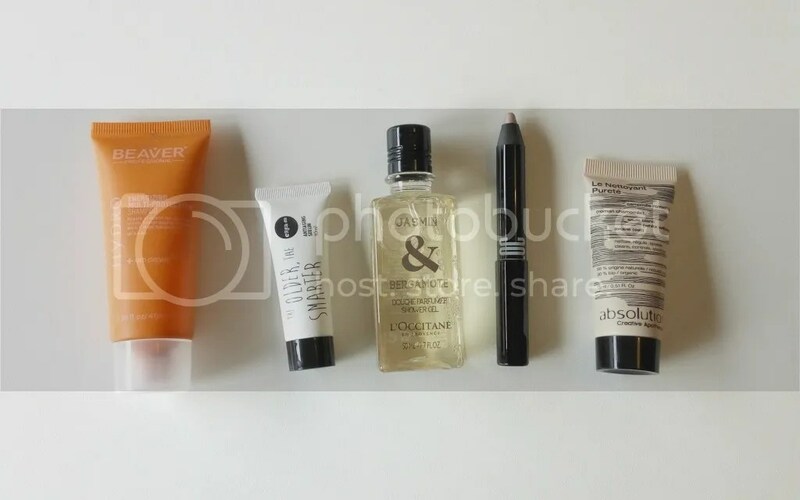 I’m pretty happy with my first Birchbox – while 4 of the 5 items are tiny sample size, I love that everything is a new discovery for me, and that there was a makeup item rather than an entire bag of skincare and bath products. This also doesn’t have any tanning products, which makes my heart sing because I am so sick of getting tanning products. Have you tried Birchbox before? What do you think of it?